15-month effort is finally over. The robot and support equipment were stuffed into our Command-and-Control trailer yesterday and left Drexel this morning. It’ll arrive in Miami for the DRC trails December 16. In seven days DRC teams face-off in the Challenge Dec 20-21 at the Miami-Homestead Speedway. Where did 15-months go? I still remember October 24, 2012, the day DRC kicked-off with the world-wide webcast introducing the teams. I still remember June 12, 2013, the day of DARPA’s Critical Design Review (CDR); we learned shortly after that our team passed and the Track B/C teams that would receive the Boston Dynamics Atlas robot. Everything after that was a blur. There was DRC Day in Atlanta (October 18, 2013) and learning we passed Qualifications (October 31, 2013). 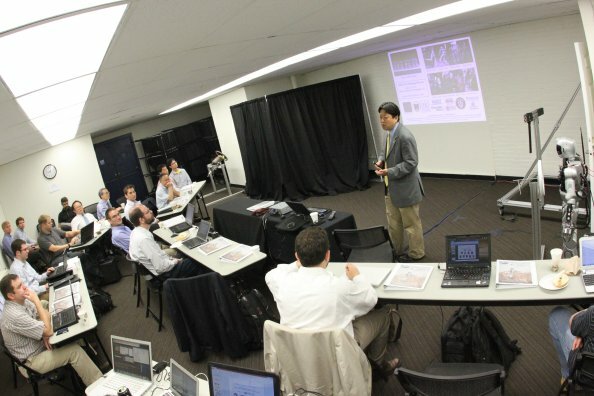 Our team had a Dry-Run November 21-22, 2013 and “rehearsed” what we envisioned would happen in Miami – and discovered we still had some work to do! But at heart, it’s about winning… to be among the Top 8 teams that DARPA selects in Miami to continue to the Finals in December 2014. I can imagine the “agony” that my students would feel if we don’t make the Top 8. I don’t want them to feel their “labors to be in vain and efforts to be futile” (Psalm 127:1). That said, Dry-Run showed us that we can score at least 1 point in each event in the allotted time-limit. DRC-Hubo can drive the vehicle (1 point); walk over rough-terrain (1-2 points); clear debris (1-point), open doors (1-2 points), break walls (1-point), climb the ladder (2-3 points); turn valves (2-3 points) and handle fire hoses (1-2 points). Thus on a “bad day”, out of a top score of 24, we can score 10-points. On a “good day”, we can score 15-points. We’ll see… this baby/wedding/graduation is coming in 7-days! Wish us success. Why a DRC? The DRC is about disaster response and humanitarian assistance. The tragic thing about the Fukushima Daiichi nuclear accident in 2011 was that if valves and switches could have been activated at the earliest stages of the meltdown, much of the nuclear catastrophe would have been prevented. Radiation was too high for anyone to activate these valves and switches. Furthermore, wired and wireless connections were compromised. So everyone asked where were the robots? The sad thing is that existing robots were simply not capable of activating, let alone reaching, such valves and switches. Thus the DRC attempts to have these technology gaps addressed, using the Challenge as a catalyst. On the eve of the 12th year since 9/11, disasters, whether accidental, natural, or intentional, is a stark reminder that mitigation concerns everyone. T minus 100 Days (T-100 Days): In about 15-weeks, team DRC-Hubo will start packing its trailer and driving 2-3 days from Philadelphia to Miami. 15-weeks may sound like a lot of time to some, but pragmatically it’s hard to get work done during Thanksgiving and the year-end Holidays; there are final exams at universities, holiday shopping and travel – and snowstorms in the Northeast. With this mind, we continue to accelerate our efforts now to provide some buffer time later. Verification Stage: The “teaser” video above is a result of a “verification” stage performed during the summer. Called V&V (verification-and-validation), engineers assign a first phase to assess (verify) their design’s performance. This phase is followed by a second one (validation) where performance is measured by non-designers. The net effect is to ensure the design performs event specifications as engineered. In these last 100 days, team DRC-Hubo is entering the validation phase. I use the “smartphone and apps” as an analogy for our team’s approach. The robot (nicknamed DiRC, pronounced “derk”) is like the “smartphone” and events are “apps”. You want ladder-climbing, then launch the associated app, and DiRC executes the event. You want vehicle driving, load that app, and our robot drives the utility vehicle. Our team (led by Drexel) is composed of 8 universities with each school developing an “app” (8 of them) for DiRC provided by KAIST/Rainbow. Unlike other teams that use a “not invented here” mindset, I feel our “app” analogy promotes “crowdsourcing” to let best practices emerge. This helps accelerate design, reduce engineering burden and lessen risk. Time will tell if our multi-university and international collaborative “invented together” approach will succeed… we have 100-days left to do so! I’d love to see how the other teams are doing… and gauge if we’re on track, behind or ahead. It’s been a crazy-busy summer for Team DRC-Hubo and hence my blogging lapse (sorry!) so first let me explain the title. On July 11, 2013 DARPA gave their “green light” to 13 teams (6 from Track A and 7 Atlas-based ones) for competing in Miami this December – I’m pleased to say our Track A team is one of the six. So, describing how our team got to this points might be a good way to kick-start this blog again. Top 5 (oops, I mean 6) Track A teams Announced: On June 25, 2013 DARPA emailed our team saying that we passed our Critical Design Review (CDR). However, DARPA had a press embargo in effect; the Track A teams that would go to Miami (called a down-select) would be announced July 11. Towards this, DARPA requested Track A teams to create a 2-min video which they’d play at the news release. Before going further, let me share what went on with CDR. In early June 2013, DARPA visited the 7 original Track A teams to access their progress and to eliminate 2 teams. This is called down-selection – forcing teams into a competitive Darwinian “survival-of-the-fittest” mode. The review was intense where we accelerated schedules and intensified efforts in preparation. 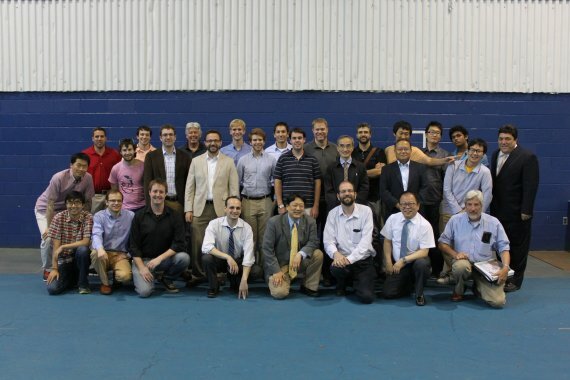 On June 12, 2013, we thus hosted DARPA’s “review” of our team at Drexel (see figure below). Perhaps old news now, but we passed (see group photo below, smiling but tired) – Go Team DRC-Hubo! Atlas Unveiling: So July 11 comes and the DARPA world-wide announcement is released. Again, perhaps old news by now, but the announcement centered on Atlas, the Boston Dynamics humanoid that will compete in Miami. Seven of these robots were to be given to the top 9 Track B and C teams. Almost as a footnote, the press release mentioned the 6 (not 5) Track A teams also going forward to Miami and DARPA provided a short video of these Track A teams. To be frank, I was a bit disappointed that the press announcement did not talk much about the Track A teams. After all, we put so much effort into CDR. More news about our (and other Track A teams) efforts would have been edifying. But I understand – DARPA invested a lot of dollars into Atlas and hence their focus made sense. Miami Semi-Final? 13+ teams (7 using Atlas, 6 Track A teams and an undisclosed number of unfunded teams) will meet in the Homestead Speedway in Miami December 20-21, 2013, to compete. I call this a “semi-final” because DARPA said they’ll select the Top 8 performing teams. These 8 teams will then have 1-year to prepare further and in December 2014 will compete to be the top team (and awarded the $2M prize). I believe our chances of making the Final 8 are strong. Team DRC-Hubo just concluded its 10-week “summer boot camp”. Our 8 partners all gathered at Drexel, sleeping and dining together in dorms, coding together in our “base camp”, and verifying their approaches in the mock-up. It was intense but it built up both “DiRC” and team morale into a long-lasting memory. It’s not just about building robots, but about building friendships and building the knowledge base – and most importantly, building for tomorrow’s disaster-response. In less than 2-months, software teams will compete in the Virtual DRC. The top teams will get their own Boston Dynamics Petman/Atlas humanoid! Big Question: So what comes with the Petman/Atlas robot? And more specifically, what are the sensors? 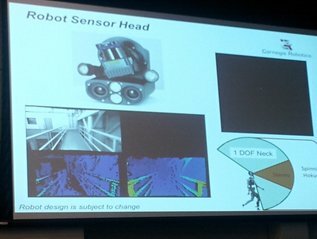 Possible Answer: At the October DRC Kickoff Meeting, I snapped a photo of the slide describing the Robot Sensor Head. Apparently a company called Carnegie Robots will provide a MultiSense-SL with the Petman/Atlas. The DRC website has a datasheet describing this head. It isn’t very detailed but from looking at the photo, my “best guess” is that the head employs a Hokuyo UTM-30LX-EW LIDAR sensor to provide range data. I asked some colleagues for their “best guess” and they agree. Why the Hokuyo UTM-30LX-EW? First off, a DRC robot needs a suitable sensor to gauge range, and LIDAR (Laser Imaging Detection and Ranging) is a viable choice. Second, the sensor should be light-weight and operate outdoors. Looking at Hokuyo’s product line, a photo of the UTM-30LX-EW matches the ones in the DARPA slide and the MultiSense-SL datasheet. One might know that Willow Garage’s PR2 robot employs a similar LIDAR sensor called the Hokuyo UTM-30LX. It’s similar to the UTM-30LX-EW but employs USB interfacing and doesn’t have multi-echo detection (and hence not suited for outdoor use). Sample Trials Using the Hokuyo UTM-30LX-EW: Our lab acquired one of these sensors. In the above photo, the sensor captured range data (right) of a golf cart (left). Here’s a video using the sensor to segment different areas of the vehicle. Tutorial on the Hokuyo UTM-30LX-EW: A quick Google search doesn’t show much info beyond performance specifications. So, I had my student (Mr. Karthikeyan Yuvraj) write a “Getting Started” tutorial. He’s working with our DRC partner Prof. Christopher Rasmussen from the University of Delaware. Below is a photo of his prototype sensor. One can see the Hokuyo UTM-30LX-EW mounted below the cameras (binocular lens). The tutorial assumes knowledge of Linux (Ubuntu) and ROS (Robot Operating System). The tutorial uses open-source tools like the 3D visualization tool RVIZ. Summary and Impact to DRC: The Hokuyo UTM-30LX-EW is a relatively affordable sensor that can fit on a DRC robot without taking up much space or consuming much power. It can operate outdoors and hence meets DARPA’s requirement that all 8-events of the DRC will be held outdoors. Yes, that’s correct – that’s our team’s robot Hubo on the left, the off-the-shelf Darwin-OP from Robotis in the center, and the Boston Dynamics Petman/Atlas on the right – all in the DARPA Robotics Challenge Simulator (DRC-Sim). In the background is a computer model of our golf cart which serves as our surrogate test vehicle. Links to tutorials are given at the end of the blog. Here’s a YouTube video of the above screenshot. Why Care? The DRC-Sim and Virtual DRC is an example of crowdsourcing – generating solutions to complex problems by leveraging the efforts of many diverse people. The DRC-Sim and the chance to be awarded a real Boston Dynamics robot provide both tools and incentive to get many solutions. From what I heard, over 100 self-funded teams registered for Track C to compete in the Virtual DRC (V-DRC) this June. It will be exciting to see what happens! With about 6-weeks until the V-DRC qualifiers in May, we’re beginning to see some cool results from Tracks B and C teams. Check out Dr. Jerry Pratt’s DARPA-funded Track B team YouTube videos! Do You Need a PhD to Use DRC-Sim? Not exactly – but remember, the DRC is what is called “DARPA-hard” – something that is very difficult but not impossible to achieve. Past examples of DARPA-hard include landing man on the moon and radar-defeating stealth aircraft – not impossible tasks but very difficult to accomplish. The fact that there’s a $2M prize for the winner of the DRC suggests the 8-events of the Challenge are indeed DARPA-hard. Otherwise, wouldn’t anyone and everyone enter? Frankly, those who are computer-literate can get DRC-Sim installed and running and those with Linux/Ubuntu experience can do so even faster. The difficult part is what to do afterwards! You have to write algorithms that command the robot to walk, enter a vehicle, climb a ladder, operate hand-tools and turn valves. Understanding biped walking gaits, dexterous manipulation and motion planning often demand graduate-level robotics courses. Even then, what works in simulation does not always work in the real world; things like friction, the interactions of the feet and the floor (e.g. walking on pavement is different than on sand), and dealing with lighting (e.g. shadows, glare, etc) all make the DRC “DARPA-hard”. So Why Darwin-OP? I see the DRC as a teaching moment for building a community. The U.S. lags far behind Asia and Europe in humanoids. As such, the DRC is an opportunity for the U.S. to re-build momentum in this area of robotics and join other countries to showcase capabilities and potential. However, working with full-sized walking humanoids requires a lot of resources. In other words, the “barrier-to-entry” is high not only for general people but for research institutions like agencies, industry and academic labs. Geating at Drexel custom-made a “car” for Darwin-OP to drive so these students can mimic the real DRC’s Event 1 (utility car driving). By having students use the Darwin-OP model, I hope they will appreciate the DRC-Sim and the disconnect between simulation and “reality”. Tutorials: As such, I assigned Drexel engineering student Bharadwaj Ramesh who had no Linux experience go through the Tutorials on the DRC website. He authored his own tutorials (including how to install Ubuntu) and finally ended his assignment with importing Hubo and Darwin-OP models. See YouTube videos of Hubo and Darwin-OP in DRC-Sim. As for Team DRC-Hubo, we have our own simulator (called OpenHubo) based on OpenRAVE – a well-known motion-planning simulator. If you’re interested, you can download the Hubo CAD models from Git Hub and try developing your own algorithms in either DRC-Sim or OpenHubo. More tutorials will come. Part 2 will show how to make Darwin-OP walk in the DRC-Sim. Stayed tuned. Please let us know what you think! Especially about Mini-DRC, or using Darwin-OP and/or Hubo in DRC-Sim or OpenHubo! If Boeing isn’t American does that mean Hubo isn’t Korean? My Slip-of-the-Tongue: In 2006, I made the mistake of saying that “Boeing is an American company” in a speech to Boeing executives in Seattle. To give context, this was after Boeing hosted me for 10-weeks as one of 12 Welliver Fellows to provide advice to their Enterprise. 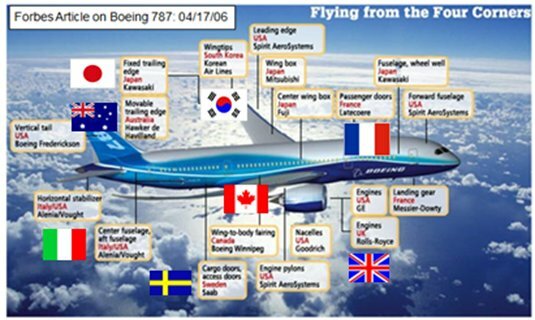 One senior executive corrected me saying that “Boeing is a Global company” rather than simply an American one (see figure below showing Boeing’s 787 was a product of multiple countries). At first, I thought his statement was just marketing rhetoric. But I made a similar mistake that year again. In an audience of executives in Seoul, I said “Samsung is a Korean company”. Their VP corrected me saying that Samsung isn’t Korean but is a “Multinational” company. Was this just rhetoric? Mind you, this was 2006 – about the time “The World Is Flat” by Thomas Friedman became a best-selling book and before the word “globalization” became part of everyday language. I grew up associating brands with countries; Rolex is from Switzerland, BMW is from Germany and Sony is from Japan. However, like many things today, associations are blurry. Are Hyundai cars assembled in Alabama still Korean? Are iPhones manufactured in China still American? Sure, one can debate nationalities of products, but one can also appreciate that the “borders” are blurry and less defined that in years past. 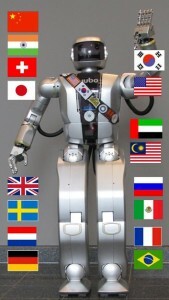 Hubo is “Global” too: Let me begin by saying Hubo was conceived, designed and developed by Prof. Jun Ho Oh at KAIST (Korea’s leading science and engineering university). Since its debut in 2000, each generation of this humanoid captured international headlines. In some senses, Hubo is an icon of Korea’s robotics program. 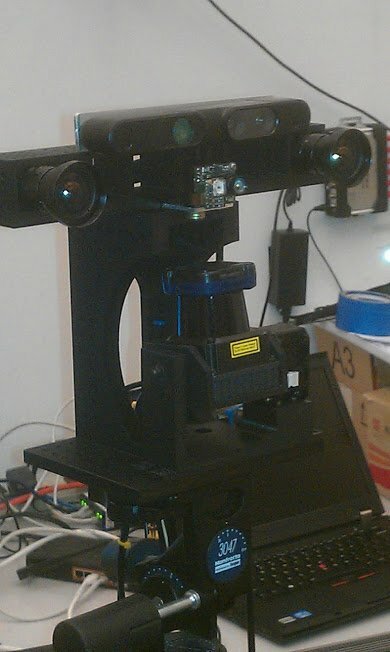 In 2008, my lab acquired a Hubo from KAIST through the US National Science Foundation’s PIRE program. Like computers, Hubo needs application software to be useful. The goal of our grant was to marry KAIST’s world-class robot hardware designers with America’s world-leading robot software researchers. This global marriage endeavored to catalyze humanoids by giving the robot the (machine) intelligence to physically do useful tasks. 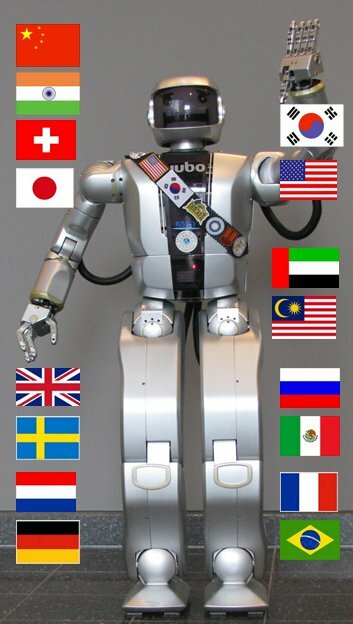 Without “American” software, Hubo would simply be a mechanical puppet and without “Korean” hardware, the “intelligence” could not be applied… Hence, I argue (and I think my colleagues agree), Hubo is “global” too. The figure shows the different areas of Hubo partners are working on. US Students at Risk: The National Academies report that less than 3% of American science and engineering students have any significant (non-tourist) experiences abroad. By contrast, over 50% of European and Asian students leave their continents for 6+ months working in labs overseas. These aren’t back-packing vacations or globe-trots. Rather, European and Asian students are learning cross-cultural skills and developing international networks to work in “global” companies. These students will be the designers of tomorrow’s consumer electronics, gaming consoles, automobiles and airplanes. They will fuel their country’s economies with new products, multinational markets and global services… Can American students compete given such statistics and mindsets? Hubo – Teaching US Students Skills for International Collaboration: Unlike perhaps many liberal arts students, American computer science and engineering majors see little need to go overseas to learn. After all, with the internet can’t one simply collaborate over email and Skype? Also, isn’t America the “best” technologically – so why go abroad? I asked the same question when I started our PIRE project. I doubted that my students would study 3-terms of Korean language, live in Korea for 6-months working full-time in the KAIST Hubo Lab, and engage in a culture very different from America. To my surprise, many of my students were willing to leave their “comfort zone”. The opportunity to get another key-hole into life, double their perspective by seeing the world outside of America, and to work with a world-class robot was too good to pass up. I’m happy to say that from 2008 to 2012, I’ve sent over a dozen American students to Korea – you can see their blogs here. For many of these students, Korea was their first trip outside of the US (and for some, even outside of Philadelphia). Some never flew on an airplane before. Some never had a passport – nor did their parents. Some were nervous (doesn’t the world hate Americans?). Some would miss Thanksgivings, family reunions and friends’ birthdays. But they all returned intrepid world-travelers! They gained confidence and boldness. They learned to adapt to new cultures and relationships. They self-actualized. Moreover, they learned how to collaborate with non-Americans developing a very complex robot – skills they can translate when they join the “Boeings” of tomorrow to create “global” products. DRC is Global Too: As you probably know now, the DRC was motivated by the limitations of the Fukushima disaster response. Fukushima had world-wide impact, not only with radioactive spread but with disrupted global supply chains. As such, DRC-Hubo has even more significance than simply bringing Korean and American roboticists together. DRC-Hubo provides both “learning” and “teaching” moments ranging from technology, international collaboration and designing products for the greater good of all mankind. With that, Hubo may have originated from Korea but today is a result of a US-Korea collaboration for tomorrow’s global needs. Godspeed and Open to your comments! DARPA began their site visits of Track A teams a couple of weeks ago. 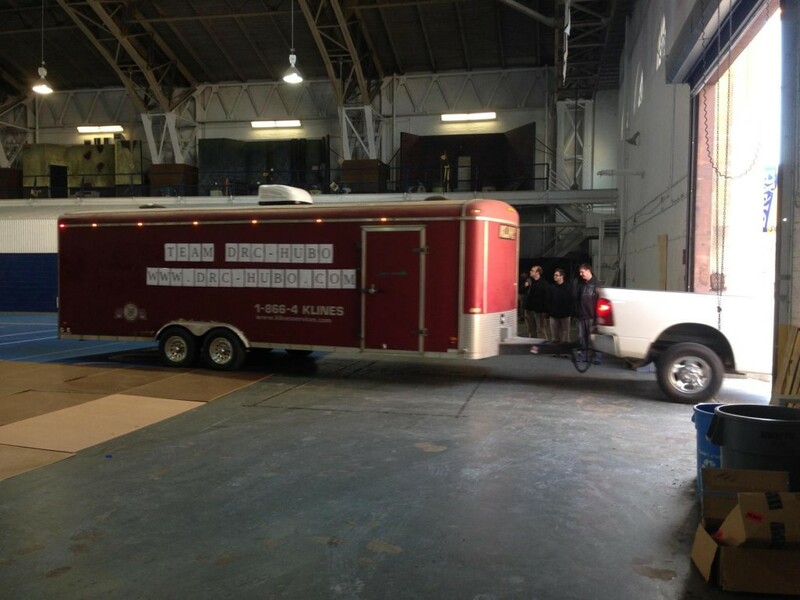 DARPA arrived at our lab at Drexel on February 19th. Pins and needles could only describe our feelings preparing, rehearsing and giving the best “show-and-tell” ever! Site visits are anxious moments. DARPA wants to see REAL stuff working – not hear PowerPoint talks! Our team mates at Ohio State (OSU), Purdue and Georgia Tech (GT) continue to amaze us with what they have accomplished in their events. DARPA saw their videos of OSU-Hubo walking over rough-terrain, Purdue-Hubo climbing a ladder and GT-Hubo breaking a wall. All in all, DARPA looked happy with our progress and our plans moving forward. We Even Published: To my best knowledge, we’re the only team already demonstrating these events. So, we wrote technical papers on each event, which were peer-reviewed and accepted for publication (yippee!) in the 2013 IEEE International Conference on Technologies for Practical Robot Applications (TEPRA). Each paper details our approach to all 8 events, illustrates simulations and discusses the experimental results. We expect that IEEE will publish are papers in late April. Once they are published, visit us again to see videos and more photos. Why Publish? You may wonder why we are publishing. Wouldn’t such disclosure tip off our competitors and undermine our chances for the $2M prize? Perhaps this is true. But moreover, we are a team composed of universities. Universities exist to create, archive, and disseminate knowledge – for the greater good. This is done through both teaching and research, in classrooms and labs. Our team believes that advancing the state-of-the-art of disaster-response robots demands an open review and scientific verification and validation by the robotics expert community. Our belief in the “greater good” compels us to publish – and together with those beyond our team, help advance robotics. Let the Site Visits Begin! Hubo is a complete full-size humanoid. Its form and function are suited for all 8 events of the DARPA Robotics Challenge (DRC). Photos on right show Hubo manually configured into poses for the notional events. DRC-Hubo will be a version with hardware retrofits and algorithms for autonomy. 7 Hubos exist at Drexel University (lead PI) and are immediately available for the DRC.